The last thing I will talk about is infertility and all that goes along with that. Unfortunately, men with CF get the raw end of the deal. 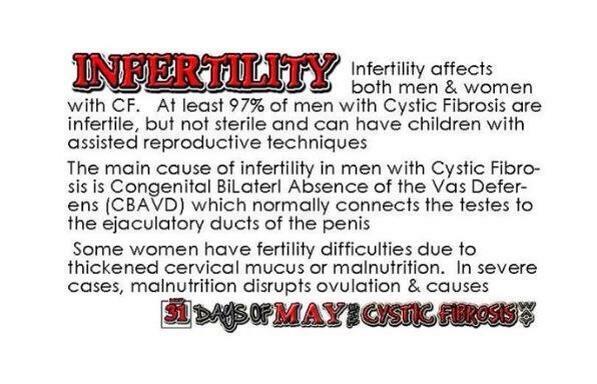 Upwards of 97% of men with CF are infertile. That’s not to say that through the magic of medicine that they can’t reproduce. It just take a lot more time, effort and money to do so. Once again the dang thick sticky mucus puts a stop to things in our bodies. There is mucus throughout your body which is to include the cervix of women. With that said, the thick mucus doesn’t allow the sperm to get where it needs to go to fertilize the egg. The egg itself might have trouble traveling down the fallopian tube also. So needless to say it could take a real miracle of God for some CF women to get pregnant. I tired getting pregnant with my ex-husband with no luck. We did artificial insemination with his goods and it didn’t take. I was ok with it not taking so we didn’t go beyond that to try. I somehow knew I would be a single mom if we had gotten pregnant regardless so, hind sight being 20/20, it was a good thing. My lung function was better then and I got the ‘OK’ from my doctor to get pregnant. I wished that my lung function was better when I married my current husband (that sounds bad and I don’t mean it to, but there will be no more husbands to add to the mix…just sayin) so that I would have felt more comfortable trying to get pregnant. We decided to get my tubes tied so that we didn’t have any oops when my body may not do well with a pregnancy. I am blessed with the 2 bonus kids I have. I love them like I gave birth to them so I am ok with my decision. God made me a mother in another way and for that I am thankful. We discussed many times the options of adoption and surrogate. We came to the conclusion that we were perfectly happy with the 2 we have. So instead of adopting a baby we got 2 rescue dogs, 1 year apart. hahaha Our oldest is graduating high school this month and our youngest is starting high school, 9th grade, next school year. We are almost done with raising kids and then it will be just us and the dogs. It would be weird to start all over now with a baby. Being pregnant for a healthy/normal person is hard on the body, just imagine throwing in all things CF to the mix. I have many friends that have had babies and multiples at that and have done great. For some their health was great before and while pregnant but started to get worse after pregnancy. For some it didn’t phase their bodies. I didn’t know which was going to be my fate so I didn’t want to risk it. I love being a bonus mom and the crazy goofy aunt! Of course there is a part of me that feels bad for not being able to give my husband a child of our own but it is what it is, I can’t change it. Every person with CF is different so what I decide for myself is not what is always best for others. You have to know your body and know what you can handle. I wasn’t ok with the possibility of my health taking a turn for the worse sooner than I hoped just to be pregnant. I am a firm believer that everything in life happens for a reason. I may not know the reason by it happened for a reason.